Ed Lee platicando con el propietario de A.C. Trading Co.
Members of the Mission District Chinese community reacted with varying degrees of surprise, sadness and bitterness to the sudden death of Mayor Ed Lee, who collapsed from an apparent heart attack on Monday at around 10:30 p.m. while shopping at the Safeway near his home in Glen Park. Tsang said she thought Lee’s reign had an overall positive effect on the city’s economy — and, generally speaking, she thought he pulled for small businesses like hers. Andy, a co-owner of Sun Fat Seafood on Mission Street, was surprised this morning when he heard the news. “He’s one of the most famous Chinese people I know,” he said. But, while Andy felt it was good to have an Asian mayor, he at times felt neglected by Lee as a small business owner in a rapidly changing neighborhood like the Mission. In 2013, the Mission’s Asian population was 12 percent. Lai Lee Choy, 84, said through an interpreter that she thought Lee was far too young to die and still had a strong political future ahead of him. Lee was the city’s first Asian American mayor. Jackie Tan, 23, who works at the Bethany Center, said he met Lee twice during charity and volunteering events. “He seemed like a nice guy,” Tan said. But, like Andy at Sun Fat Seafood, some business owners felt that the first Chinese mayor had not done enough. Lee, a manager at Casa Thai Market on 16th and Mission streets, said that, although Mayor Ed Lee was great for the economy and “everyone loved him” for it, some issues could have used more of his attention. “Can’t say much about the homeless,” he said, pointing around the 16th Street BART Plaza. 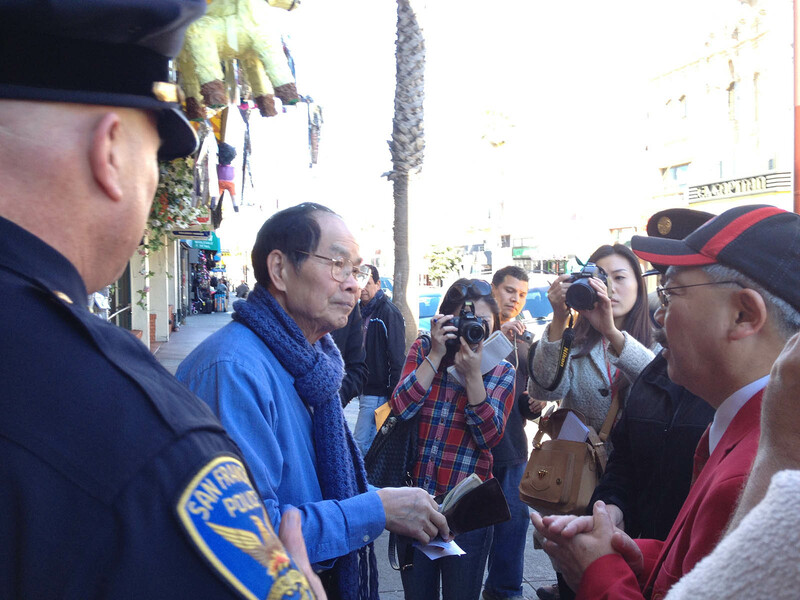 Tsang, the owner of the 19th and Mission market, agreed. “Maybe he could have done the homeless situation better,” she said. Others, like Annie Luo, who runs a Chinese restaurant on Mission Street, said she and many in Chinese community felt abandoned by Lee as he supported retail cannabis in more family-oriented neighborhoods like the Sunset. “Didn’t he know anything about Chinese history?” she said, referring to the drug stigma Chinese people sometimes hold because of China’s history with the opium trade. Luo said that she and around 100 Asian-American residents recently demonstrated twice in front of Lee’s house before he signed the city’s retail cannabis law on Dec. 6. But she also said the dissatisfaction in the community had been building “day by day, week by week, year by year,” largely because, in the face of mounting unaffordability in the city, Lee remained partitioned off from their concerns. As a Chinese American , I don’t agree with some of his policies strongly too. But I think those screaming protesters are rude to bother people at their home early in the morning when people are trying to rest. Some of those ladies looked like they didn’t know why they were there according to some family members. You can see in pictures they are wearing dark glasses and caps, and hding from the camera. By all account he is very hard working mostly for the city. Besides the cannabis issue was the result a vote by the people. Some of these immigrants from countries without democracy or legitimate elections don’t understand that. If they don”t like the election result they should petition to get a ballot in the next election to overturn the results,instead of harassing people. I was very embarrassed by some of these people claiming to represent all Chinese or all sunset residents screaming non sense. And every Chinese American I talked with don’t understand the claim about marijuana and Chinese culture as claimed. They are getting the drugs mixed up, e.g. opium, cracked and meth. Cannabis, and a variation of it were considered medicinal. Some of the Chinese also discriminate against the patients, insinuated that they are gay, and get AIDS and that’s why they need cannabis. One of those protester leader even want the names and addresses of those patients who can’t take the bus to other sites to buy cannabis. Also some of the Chinese in the Mission and in other neighbourhood need to learn to get along with other people. Instead always saying they are Chinese as in living in China. though it is fair to say they face discrimination too. I hope everybody can try to get along. The homeless problem is something no other mayor can solved, not just ed Lee. It can’t never be solved because new ones arrived daily.